Have you ever seen how black pepper grows? Did you know that a famous Garam Masala is not a mixture of several spices, but can also be derived out of a single leaf? Would you be able to recognise in the wild the roots of those magic powders which make your food so finger-licking good? A visit to one of the spice plantations in Goa is worth it not just to answer those questions. 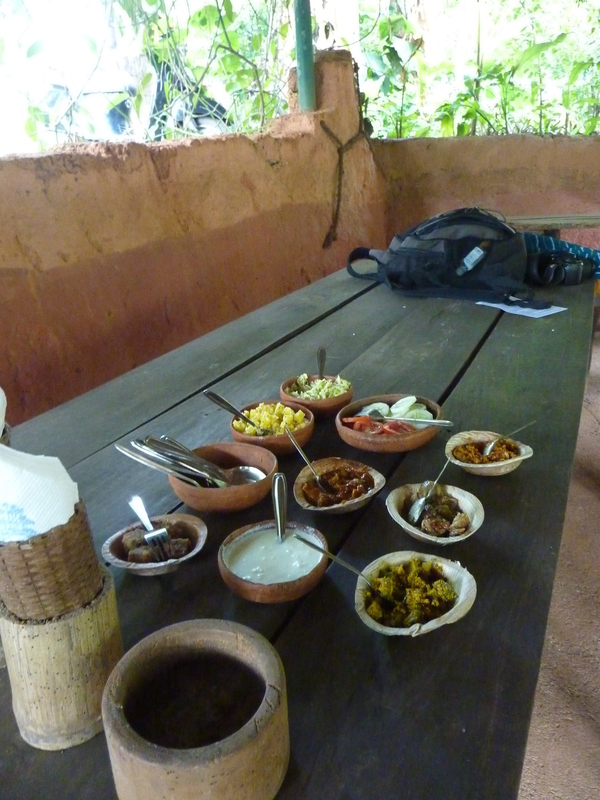 During your tour on a spice farm you will enjoy a real Indian jungle, learn things about spices you would never thought of and most likely you will be treated with a delicious traditional lunch or dinner, seasoned with the freshest spices you have ever had. Some plantations will also offer you a ride or a bath with an elephant – if you are up to such kind of entertainment, is up to you. Here is a list of the most known plantations of Goa, which visit will make your stay in this state educational, entertaining and absolutely delicious! Savoi Plantation lies 40 km away from the beaches of North Goa and 30 km from the Southern city Margao. The plantation is 200 years old and is run by a family – if you are looking for an authentic Goan plantation experience, this is the right place to go. It might be slightly difficult to find (the road through tiny villages is beautiful though! ), but a rather remote location and a less touristy approach will give you a feeling of authenticity and a necessary wilderness, which is associated with a tropical farm. You will have no elephant rides on offer, but a 10-course lunch, representing local cuisine, which will be served to you at the end of the tour, is an absolute highlight and is worth a trip on its own, as it might be the best food you will try in Goa. Abyss Spice Plantation is also located in the Savoi-Verem, on a top of a mountain, and it is mostly famous for its medical and Ayurvedic plants, grown organically. You will be taken on a tour by an Ayurvedic doctor, which is not offered by any other spice plantations. At the end of the tour, you will also have a chance to experience Ayurvedic massage. Sahakari Spice Farm is located in South Goa in Ponda, 25 km away from the Colva Beach and 35 km away from Panjim. This plantation is a rather commercial and touristy place with a standard entertainment on offer, so if you are a hunter for authentic local culture a visit to this plantation can become a slight disappointment. However, if you have always dreamt to take an elephant ride or to swim with one, Sahakari Spice Farm can offer you this experience. Pasco Spice Village is located on the bank of a river Khandepar, 7 km from Ponda, 45 km from Panaji, 55 km from Vasco and 25 km fro Margao. Pasco Spice Village also offers elephant water rides and pedal boat trips. A special addition to experience in this farm is a variety of exotic birds, which you are likely to spot during your tour: cuckoos, owls and parrots are usual guests here. The Tropical Spice Plantation is located 5 km from Ponda, which will take you 45 km travel from Calangute Beach or 23 km from Colva Beach and 33 km from Panaji. This plantation is also rather on a touristy side of spice farms in Goa, which is confirmed by a number of touristic buses in front of the farm. The planation offers standard 45-60 mins tours, and elephant rides and washes are also available. Rustic Plantation is located in the extreme North-East of Goa at Dongruli Village and will give you a somewhat different experience of rural Goa. Besides a traditional plantation guests can learn how to make chapatti (traditional flat Indian bread) and watch flower garland weavers. The plantation is also a home to a holiday resort in case you are also looking for a different place to stay. Vasundra Spice Farm is another plantation which is located close to Ponda, just one km away from Rachol (Rachol-Ferry Road, close to the ruins of Rachol Fort) and has not been completely overtaken by tourists yet. The plantation is organic and promotes traditional ways of farming called Kulaghar. Vasundra Spice Farm belongs to the Ayurvedic doctor and is famous for its Ayurvedic restaurant.